https://sep.yimg.com/ay/yhst-33477391359232/blue-ridge-coral-heliopora-coerulea-blue-fire-coral-9.jpgBlue Ridge Coral - Heliopora coerulea - Blue Fire CoralEasyPeacefulYesCalcium, Strontium, Trace elementsIndo-PacifcHelioporidaeSmall 2" - 3"
Blue Ridge Coral is an interesting Soft Coral which resembles Small Polyp Stony (SPS) Corals significantly. Blue Ridge Coral secretes a beautiful, sky blue colored exoskeleton, unlike the other soft corals, which is used for various decorative purposes. Blue Ridge Coral enhances the visual appeal of a marine aquarium considerably. Its rapidly growing large colonies yield a full look to the marine aquarium hosting it. Right from the beginners to the veterans, all the aquarists can try their hands out at Blue Ridge Coral. The ensuing discussion throws light on the various aspects of Blue Ridge Coral which will prove handy as regards its maintenance in a reef aquarium. Other names: Blue Ridge Coral belongs to the Family Helioporidae, Genus Heliopora and Species coerulea. The scientific name of Blue Ridge Coral is Heliopora coerulea. Blue Ridge Coral is also commonly called as Blue Fire Coral and Blue Coral. Coral Type: Blue Ridge Coral is a Soft Coral. Origin or natural range: Heliopora coerulea exists in the equatorial reef region and is found in the Western Pacific Ocean, the Red Sea, Southern Japan and Africa�s Western and Eastern coasts. Color: Blue Ridge Coral occurs in brown, tan, cream and blue colors with brown colored polyps. Compatibility: Blue Ridge Coral is not aggressive towards the other marine aquarium invertebrates. Morphology: Blue Ridge Coral is the only reef building Soft Coral which has a hard skeleton. The body of Heliopora coerulea is composed of Calcium Carbonate and Iron salts. The structure of the Blue Ridge Coral is columnar, encrusting, branched and plate-like. When alive, Heliopora coerulea is brown in color. Blue Ridge Coral has a hard skeleton composed of aragonite deposits. The skeleton of Blue Ridge Coral is sky blue in color owing to its absorption of iron from the marine water around it. Blue Ridge Coral then oxidizes the absorbed iron into blue salt which is subsequently deposited into Heliopora coerulea�s skeleton imparting it blue color. The outer surface of Blue Ridge Coral is covered with long and thin olive colored polyps. Each polyp of Heliopora coerulea has eight tentacles. Habit & Habitat: Blue Ridge Coral forms large colonies and lives in shallow water on the upper slopes of reefs and the upper hardpan regions of lagoons. Due to its vicinity to the surface of water, Blue Ridge Coral shows up when the tides are low. Temperature: Seventy-two to eighty-three degrees Fahrenheit or twenty-two to twenty-eight degrees Centigrade. 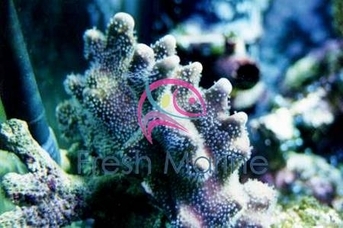 Illumination: Blue Ridge Coral requires high intensity lighting in the reef aquarium it inhabits. Metal Halide lighting is recommended for Heliopora coerulea. Water flow in the aquarium: Blue Ridge Coral needs strong water current in the marine aquarium hosting it. Marine aquarium habit & habitat: Place Heliopora coerulea, along with its natural anchor, on or between the rocks in your marine aquarium. Blue Ridge Coral grows rapidly in a marine aquarium over rocks and even on the glass of the aquarium. Feeding & Nutrition: Blue Ridge Coral derives its nutrition mainly through photosynthesis which is performed by, zooxanthellae, a photosynthetic alga living symbiotically within Heliopora coerulea. Blue Ridge Coral is also Carnivorous and filter feeds upon acellular marine invertebrates, meaty bits, zooplankton and phytoplankton. Add Calcium, Strontium, Iodine and trace elements to the water as dietary supplements for Blue Ridge Coral. Don�t add extra Iron to the marine water in your aquarium as the Blue Ridge Coral will get the required quantity of element from the surrounding water. Care: Blue Ridge Coral requires moderate care.